It's time to get excited for a t-shirt transformation! T-shirts are cheap, widely available, and comfortable to wear. They're an American wardrobe staple, sold everywhere from the dollar store to upscale department stores. T-shirts are often given away for free at events, which contributes to the average person's large collection of unused t-shirts. If you've got old t-shirts that you don't know what to do with, this free eBook full of t-shirt crafts is for you. With this free t-shirt transformation eBook, you'll learn so many things to do with t-shirts--how to make clothing, accessories, and more out of old t-shirts, and how to makeover and recycle t-shirts into stylish articles of clothing. Learn 9 Ways to Transform Old T-Shirts with old t-shirt crafts. Download your free copy of the 9 Ways to Transform Old T-Shirts eBook today! In this free t-shirt crafts eBook, compiled for you to download by the editors of AllFreeSewing.com, you'll find 9 t-shirt crafts for how to recycle t-shirts and make your own t-shirt transformation. Start off simple and just try a t-shirt transformation to refashion an old t-shirt, and then move on to sewing new articles of clothing and accessories from t-shirts. Also be sure to check out the miscellaneous t-shirt crafts section for home decor projects and more, all using those t-shirts we all have lying around the house, collecting dust. Download a free copy today and start your t-shirt transformation! 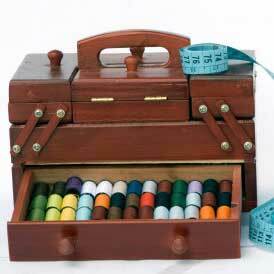 Free sewing eBooks are the ultimate resource for sewers and sewing enthusiasts. Each eBook includes a collection of free sewing projects and pattern organized around a theme, such as holidays, home-dec, clothing and plenty more. You can easily download and print out each book for on-hand reference while sewing. You can find our complete collection here. Since the dawn of sewing, all kinds of seamstresses, tailors, and the like have utilized their resourcefulness to find fabric everywhere. Just like using old linens for clothes back in the day, the tradition of upcycling pre-made goods continues today with t-shirts. Originally released in 2010, 9 Ways to Transform Old T-Shirts rewards is a free eBook that rewards those who constantly seek repurposing projects. It's incredible what you can make from old t-shirts, and whether you're an old hand to this useful skill or just learning how to turn t-shirts into treasures, this collection of DIY t-shirt projects will certainly come into play when you face that bin of old high school tees. Join us in learning the art of refashioning for home decor, clothing, and accessories by downloading your free copy of 9 Ways to Transform Old T-Shirts today. Download the 9 Ways to Transform Old T-Shirts eBook now! Old t-shirts do not always have to turn into new t-shirts or wearables. Since tees are basically just big swatches of fabric, especially those extra-large ones you just cannot get rid of, they are the perfect piece of old clothing to use when creating new DIY home décor pieces. You can transform old t-shirts into pillows, quilts, blankets, sustainable grocery bags, and more! These awesome craft ideas will look adorable in your home. Take a peek at some of the stellar free tutorials inside this transformative eBook. 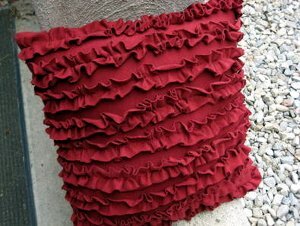 Ruffle Pillow Tutorial (pg. 5) - Recycle t-shirts and use them to cover a pillow with rows and rows of ruffles, using old t-shirt crafts. The ruffles made from the worn fabric create an extra soft t-shirt transformation, making it the perfect place to lay your head. T-Shirt Pillow (pg. 13) - This t-shirt reconstruction is the perfect balance between creating a cheap and green craft and preserving your memories. If you have any shirts that you do not want to part with that may be stained or ripped, this t-shirt transformation is the perfect pattern to give it new life. This would be a great way to show your pride for your favorite sports team or alma mater, too. While many t-shirt reconstructions turn your old tees into brand new pieces like skirts, dresses, bags, or even yoga pants, these t-shirt reconstruction ideas are all simple t-shirt embellishments. This means they are quick and easy projects. Creating an embellishment is much easier than you might think. Revel in the simplicity of these minor changes that have big impact, and keep them on hand when you want to cover up a small stain or tear to save a favorite t-shirt from having to be retired entirely. Petal Tee (pg. 35) - This fab little t-shirt is a quick and easy t-shirt upcycle. Created by using scraps of fabric to create a colorful petal collar, this project is cheap and simple. It is a great way to add some color to your wardrobe and use up extra scraps of fabric. Circle Flower Tee (pg. 37) - Make a top that's as simple as it is stylish. 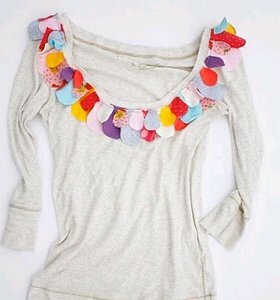 Just sew some easy embellishments from one t-shirt onto another and you'll have yourself a cute, decorative shirt. Recycle t-shirts into Circle Flower Tees, one of the easiest of t-shirt crafts. Old t-shirts are the ideal materials for green crafting projects. They provide plenty of material, making sure you do not have to buy anything else. These funky and fun accessories were all created by deconstructing old shirts into brand new DIY projects. Whether you are looking for a new grocery bag, some funky accessories, or need a new apron, you will absolutely find the perfect t-shirt project for you in this collection. Groovy T-Shirt Tote (pg. 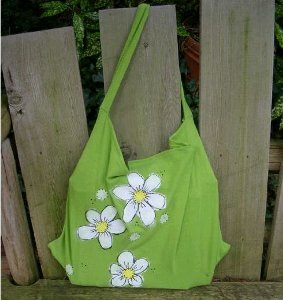 19) - This adorable free purse pattern is created by upcycling a t-shirt. This bag is sturdy and large, making it perfect for grocery shopping. Green crafting is great for the environment and there is no need to buy brand new bags to carry your groceries in. This t-shirt transformation would make an awesome beach bag, too. Scrunchy Scarf (pg. 23) - This fab scarf will make your day. Easily created from any old t-shirt, this easy scarf pattern will keep you warm and chic during the winter. How many pages are in this ebook? Does anyone know? Thanks. I think that it really can spark the imagination of a whole new group of new sewers. I love the $1 tee shirt idea. I like to teach underprivileged girls how to sew. Not traditional dressmaking, I want them to use what they have and transform it into something different and this is right up that alley. Nothing gives a person more satisfaction than taking something that they thought was hopeless and turning it into a treasure. This really wonderful to have something for free be so good. You can download the eBook by clicking the "Download the 9 Ways to Transform Old T-Shirts eBook now!" link. Enjoy! There is NO WHERE to download this book! I even did a search!